The graph shows the daily total site consumption for the past 12 months. 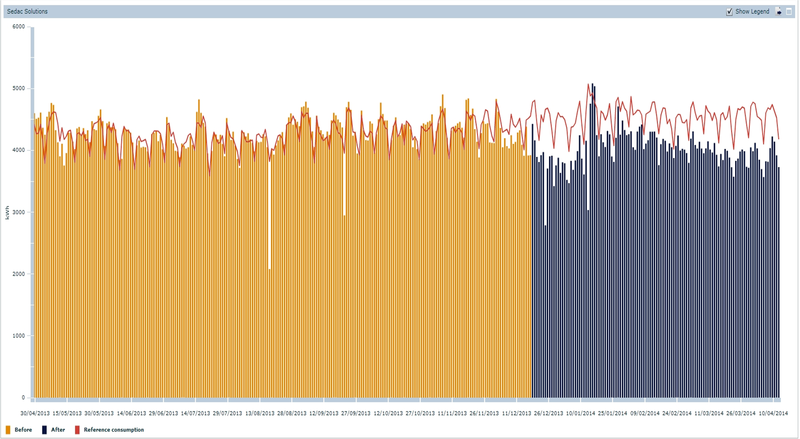 The yellow lines show daily consumption before the site was optimized, and the blue lines show daily consumption after the project was completed. The red line is the reference consumption of what the site would have consumed if nothing had changed. The installation was very successful and has resulted in savings of 12% of total electricity consumption at the site. Additionally, the site’s staff is much more aware of the importance of certain processes that reduce energy use at the site. Previously existing maintenance issues have now been reduced with the improved control and recommissioning. The solution will save Michael’s Supa IGA $20,000 per annum! The increased savings have reduced the original payback of 2 years to a revised payback of 1.8 years. This figure is conservative since we do not take any energy price increases or reduction in maintenance costs into account. This graph shows the monthly consumption year on year for 2012/2013 – 2013/2014. The August to November data shows that the store was using more electricity in 2013 than 2012. The decrease in the yellow bars in and after December highlights how the store has halted its problem of increased electricity use and is now consistently using less electricity than it did a year ago. SEDAC EM completed full re-commissioning of the refrigeration system to ensure it operates at its most efficient. The first steps were understanding the refrigeration plant and equipment. Once we confirmed how the refrigeration system was currently operating, we identified areas where improvements could be made without compromising plant, equipment and stock. Automated lighting control was installed for internal and external lighting which included zoning areas based around time schedules, staff occupancy and daylight sensing. The installed system has removed all operational inefficiencies and ensured that all lighting areas are controlled efficiently. This lighting system will not only increase the lifespan of lighting but also allow staff to concentrate on sales rather than operations. The SEDAC BEMS has ensured that the site’s air conditioning units are efficiently controlled whilst maintaining the site’s comfort level. The improved control of the system creates more efficient operation with heating demand is decreased during cold periods by recycling the heat inserted into the building from the high powered lighting. The SEDAC Energy Management System accurately measures the savings and ensures that an optimum baseline is sustained for the site. The improved visibility also assists with identification of potential issues and allow Michael’s Supa IGA and SEDAC Energy Management to rectify them. The SEDAC Continuous Review Process is completed whereby issues identified are reported and then followed up with site to ensure technical and operational inefficiencies are rectified. The dollar savings from the initiative can be accurately quantified. This greatly assisted the engineering team with proving the payback periods and quantifying the CO2 reduction achieved. By improving the staff’s understanding of site operations and involving staff directly in operational improvement, staff reported that they learned more about how the site worked. Their involvement has led to greater opportunity to improve operations and procedures. The energy saving and CO2 reduction data collected from this site can be submitted for various industry awards and to demonstrate to the wider community that Michael’s Supa IGA is continually setting higher standards for energy efficiency. A 12% reduction in total electricity usage was achieved using the SEDAC EM approach. The data and savings were obtained using sub meters plus tariff meter data which allowed SEDAC EM to provide the client with accurate energy savings results. These results will be sustained over time, making this an investment that provides financial returns for years.